It may have come together last minute (understatement of the CENTURY), but Cassies -- it's really happening. 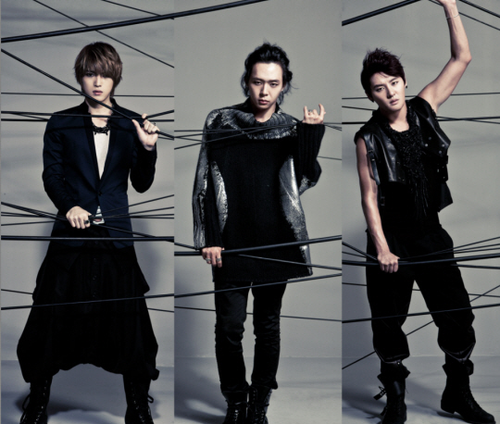 Mel + Three Members of DBSK = Sonic Boom. Not only does the concert fit in quite nicely with this blog's second birthday (more to come on that particularly exciting subject soon), it also coincides with my first official one year anniversary of being knowledgeable of the Korean Pop music game itself. Does that make up for the ridiculous ticket prices? Mmmm, no comment. For now I'll stay Bitter Betty because I like the money I work hard to earn, but I guarantee my tune will change by this weekend when I have a full report of JYJ's first official United States performance. Did you hear that, Cassiopeia? JYJ'S FIRST OFFICIAL PERFORMANCE IN THE UNITED STATES AND I'LL BE THERE. *WARNING* = If you are reading this, Melismatic has passed out due to acute Cassiopeius Fangirlitis. She should regain conciousness within a few days, possibly earlier if she stumbles upon a particularly eye-catching photo of Max Changmin. (Of course, it goes without saying this could also possibly force her to relapse.) Standby for updates, particularly to her Twitter (@melismaticdiva), especially during Friday, November 12th and Saturday, November 13th, for live and very, very eager Tweetage.